Shows » How Free Is a Free-range Chicken? It can be confusing to buy truly free-range chicken and eggs at the grocery store. The next time you’re at the store, take a close look at the labels. Chickens raised for meat or eggs... chickens that spend their days outside pecking for bugs, grubs, and fresh green vegetation... are best known as pastured poultry. If you can, try buying from a local farmer. … and they start foraging at the first glimmer of morning light. They are laying eggs while you are still sipping your morning coffee. But what exactly is a “free-range” chicken? Next time you’re at the grocery store, take a look at the labels. According to the USDA, which regulates food labeling, “free-range” or “free roaming” chickens need only be allowed some kind of access to the outside. That could mean all-day access to a lush pasture... or a tiny enclosure behind a door open for just a few minutes a day. What if the label says “humanely raised”? It turns out, the standards behind that labeling can also vary quite a lot. So if you wish to eat truly free-range chickens or eggs, how do you know what to look for? 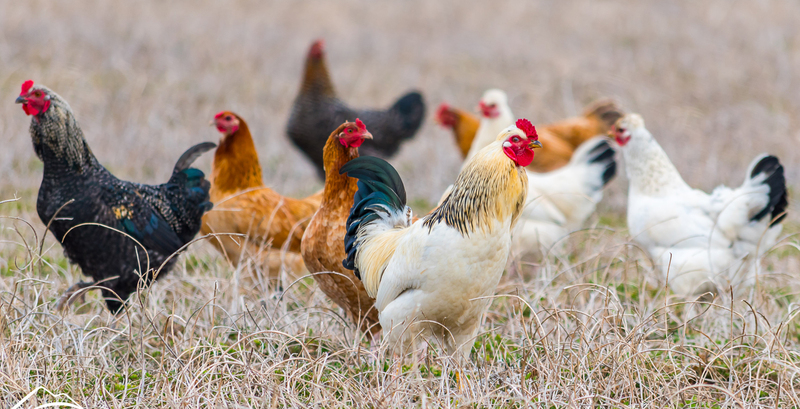 Chickens raised for meat or eggs — that spend their days outside pecking for bugs, grubs, and fresh green vegetation — are best known as pastured poultry. Look for labels that show the chicken was pasture raised or “Animal Welfare Approved.” If you can, buy from a local farmer. Or, if you have a big back yard, maybe even try raising your own chickens at home! Your decisions at the grocery store can really make a difference – for local farmers and chickens alike. What is a “real” free-range chicken? Smith Meadows Farms on what makes a “real” free-range chicken.